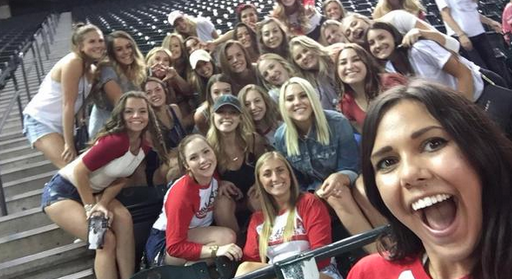 Members of the Alpha Chi Omega sorority at Arizona State attended, or more like took hostage, of the Diamondbacks-Colorado Rockies game at Chase Field Wednesday night. The announcers were not feeling it. “That’s the best one of the 300 pictures I’ve taken of myself today!” one of the announcers quipped (Steve Berthiaume and Bob Brenly had the call).